Scott Funkhouser of the Military College of South Carolina has proposed that the gigantic number 10122 (ten followed by 121 zeroes) has some special significance in our universe. He says that the ratio of the mass of the universe to the mass of the smallest possible quantum of mass is about 6 X 10121 (which rounds up to be 10122). He also says that the number of ways the particles of the observable universe could be arranged is 2.5 X 10122. He lists three other important cosmic numbers which are very close to 10122. His thesis received a write-up in the respected science journal Nature. Funkhouser is following in the footsteps of physicists Paul Dirac and Arthur Eddington, who also detected cosmic large number coincidences. But the coincidences they studied involved a much smaller large number: the number 1040 (ten followed by 39 zeroes). One such coincidence is that the simple equation ct/r (where c is the speed of light, t is the age of the universe, and r is what is called the classical electron radius) gives you a number of about 1040 , which is also about the ratio between the strongest of the four fundamental forces of nature and the weakest of those four forces (the ratio between the strong nuclear force and gravitation). I am not sure whether there is anything to these large-number coincidences, but I am sure of one thing: the number that nature really favors is not some huge number like 10122 or 1040. The number that nature really favors is a small number. Let's look at some of these many ways in which nature favors the number 3 in a deep and fundamental way. First of all, there are three main types of stable particles: the proton, the neutron, and the electron. These are the three building blocks of atoms. All solid matter consists of atoms built entirely from these three particles. Scientists say that each proton and each neutron is built from smaller particles called quarks. How many quarks are there in a proton? Exactly three. How many quarks are there in a neutron? Exactly three. Scientists also say that are three “generations” of quarks. The generations are shown in the three purple columns of the table below. The second and third generations (consisting of the top, bottom, strange, and charm quarks) quickly decay into the first generation consisting of the up quark and the down quark (the two types of quarks found in protons and neutrons). 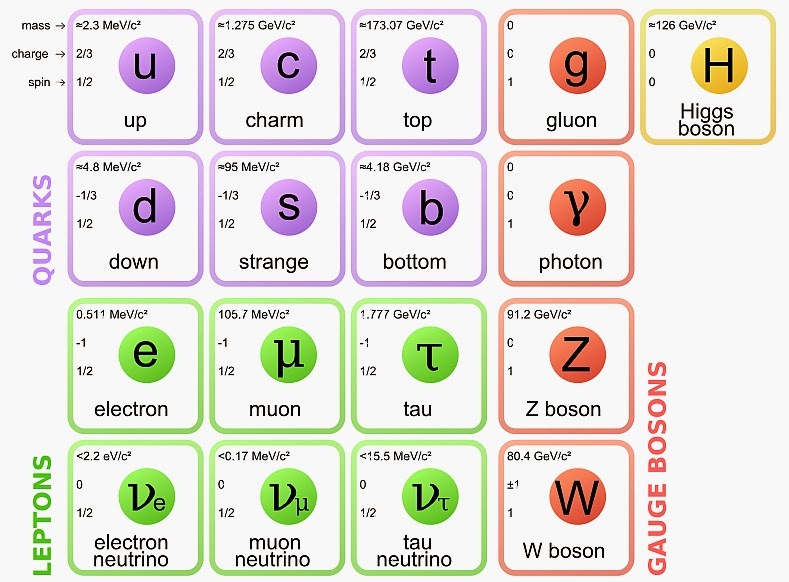 There are also three “generations” of leptons, shown as green columns in the above table. The tau and muon generations are very short-lived, leaving the electron as the only stable lepton with significant mass (the neutrinos have virtually no mass). We also have three types of massive bosons as part of the standard model of physics: the Higgs boson, the W boson, and the Z boson. There are also three types of neutrinos. On the subatomic level there are three types of charges: positive charges like protons have, negative charges like electrons have, and neutral charges like neutrons have. Subatomic particles also have an important property called spin. The leptons and quarks all have a lowest spin of ½. The four gauge bosons have a lowest spin of 1. The Higgs boson has a spin of 0. This means there are three different minimum values of spin that particles can have. As shown in the chart, there are three main properties associated with subatomic particles: mass, charge, and spin. Except for the “ghostly” neutrino particles and the energy particles called photons and gluons, each type of particle has a unique combination of mass, charge, and spin. There are three fundamental subatomic forces: the strong nuclear force that holds an atomic nucleus together, the electromagnetic force that keeps electrons in the atom, and the weak nuclear force that sometimes causes an atomic nucleus to eject a particle. The other fundamental force, gravity, has no effect on the subatomic level. Physicists say that there are three types of "color charge" involved in the strong nuclear force: what are called red charges, blue charges, and green charges. 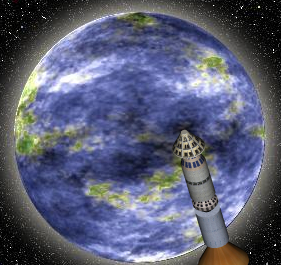 Looking at the visible world, there are three dimensions of space: height, width, and depth. There are three main types of matter: gaseous, liquid, and solid. There are three main types of massive objects: planets, stars, and galaxies. There are also three main types of galaxies: spiral galaxies, irregular galaxies, and elliptical galaxies. Almost all types of galaxies are one of these three types (with other types such as ring galaxies being very rare). Besides the three laws of motion, there are also three types of natural laws: the laws of physics, the laws of chemistry, and the laws of biology. 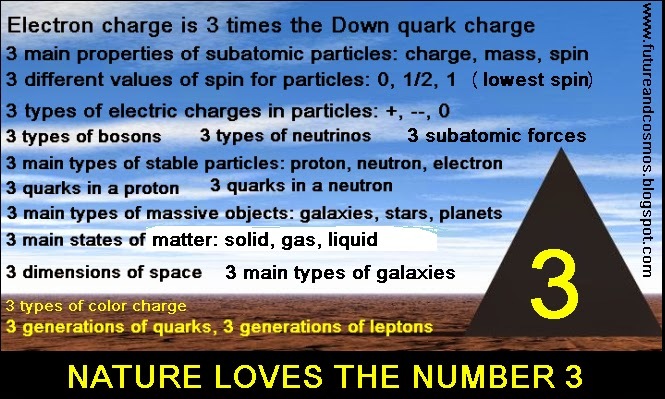 As if this wasn't abundant proof enough that nature seems to like the number three, we have the unexplained fact that the ratio between the electric charge of the electron and the electric charge of the down quark (one of the two types of quarks that make up the proton) is precisely 3.0 (three). So clearly nature seems to favor the number three. Someone disputing this thesis might point out the ratio between the proton mass and the electron mass would have been the perfect place to have put the number three – but the ratio between the proton mass and the electron mass is not three, but 1836. In response to such an objection I will point out that the number 1836 has in its digits exactly three multiples of the number three: 18, 3, and 6. In fact, when we look at this ratio to seven decimal places, we find that it has six consecutive multiples of the number three, as shown below. I rest my case. Nature loves the number three. Postscript: Here is additional evidence that nature loves the number three: an article entitled Physicists Prove Surprising Rule of Threes. For a web page with lots of visuals that delves into cases of the number three in nature and society, see this very interesting page: www.threesology.org.